An Unquiet Mind, 2016. 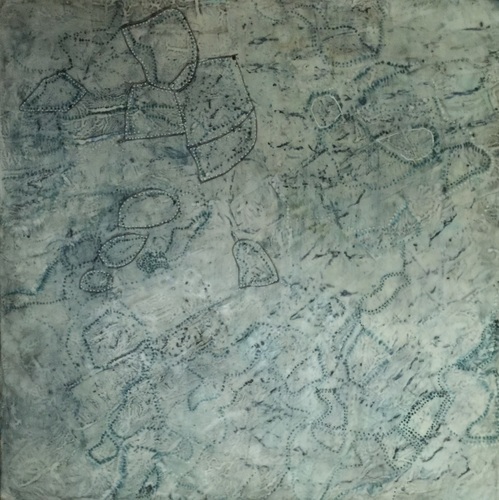 24" x 24", Encaustic, Oil, Graphite on Birch Panel. Attorney—Member of the California Bar since 1981. I practiced personal injury and business litigation for eleven years, in California, Washington DC, and Virginia. I maintain an active bar membership in California and lend my experience to various nonprofit organizations. In addition to duties as Treasurer, I teach classes and workshops to children and teens as needed. I wrote and edited website material on legal issues, led a volunteer Legal Team, trained parents in advocacy skills and conducted advocacy weeks in Washington, DC, served as Director of Public Policy, and served on the Board of Directors. I performed and traveled internationally with this Welsh-language concert choir and created the choir’s first website. JD, 1981, Boalt Hall School of Law, University of California at Berkeley.